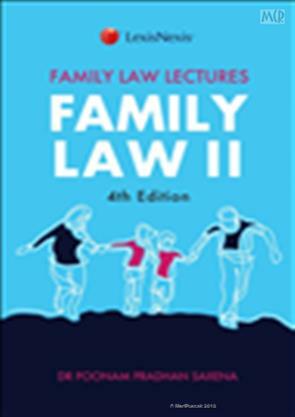 The Family Law Lectures II is an exhaustive and a comprehensive publication on the law relating to property and succession and intends to cover all major aspects relating to Hindus, Muslims, Christians and Parsis. It examines fundamental concepts dealing with the joint family, coparcenary, partition, interstate succession as well as the law relating to gifts, wills, and inheritance. The Book intends to cover major judgments of the Supreme Court and the various High Courts and is essential for LLB students, law professors, students and scholars of gender studies, and will be an asset to law and social science libraries Key Features: The book covers all the legislative changes that has been introduced since the last edition. It incorporates the landmark judgments delivered by the Supreme Court and various High Courts. The changes made by the different Constitutional Amendment Acts have been duly incorporated. This Edition has been extensively revised to incorporate the relevant and current landmark judgments of the Supreme Court and various High Courts. Up to date with the recent case laws and legislative development since the last publication. Discusses the law that has been changed and its impact on the legal system Overruled decisions have been checked and changes have been made accordingly.